I would remember that Friday as the day I flew to South Korea, but to the Koreans, the 27th of April bears a historical significance. It marked the day of the first meeting of North Korean leader, Kim Jong-un and South Korean president, Moon Jae-in during a summit. The two heads of states had a symbolic meeting in the military demarcation line in the Joint Security Area of Panmunjeom. Since the end of the Korean war in the 1950s, this is the first time a North Korean leader has entered the South Korean soil. I saw it on the news while on a bus going to Hongdae. It may not have that much of an impact on me or other Filipinos, but for some reason, I feel fortunate that such a momentous event coincided with my first visit to South Korea. Seoul is the capital of South Korea and the 4th largest metropolis in the world. The city has 25 districts, over 9.8 million in population, and 5 UNESCO World Heritage Sites. 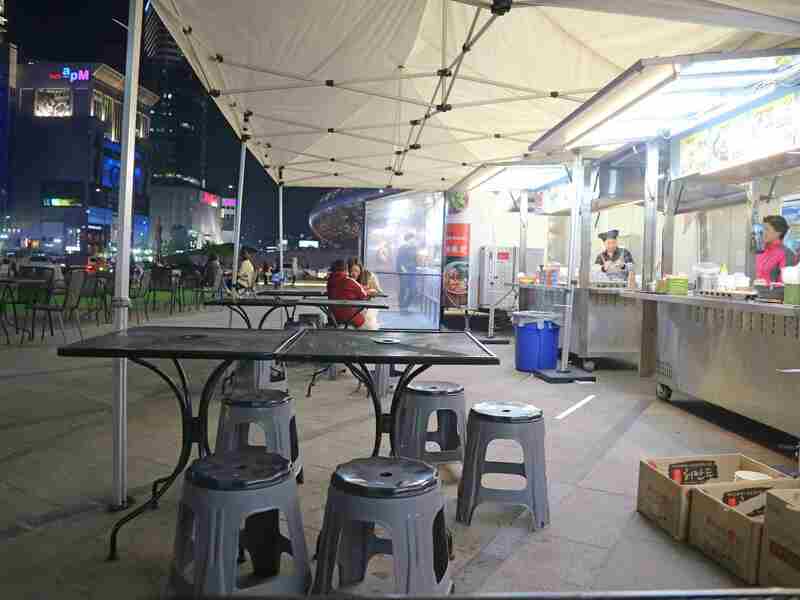 It can be found in the northwest side of the country, strategically located over the Han River. Its main airport is Incheon International Airport where my plane landed. I have a friend who was also visiting South Korea the same time I did. I mentioned that I was ordering a SIM card via Klook. She said that she would be renting a WiFi device and that I could just tether to it, discouraging me from getting the card. I thought about my options, we wouldn’t be staying in the same place and I’d fly to Seoul several hours ahead of her, not having my own source of the Internet in a non-English speaking country would be a terrible idea. Thus, I went against her advice and got myself a SIM card. It turned out to be a sound decision as my friend had a credit card problem that she wasn’t able to get the WiFi device. 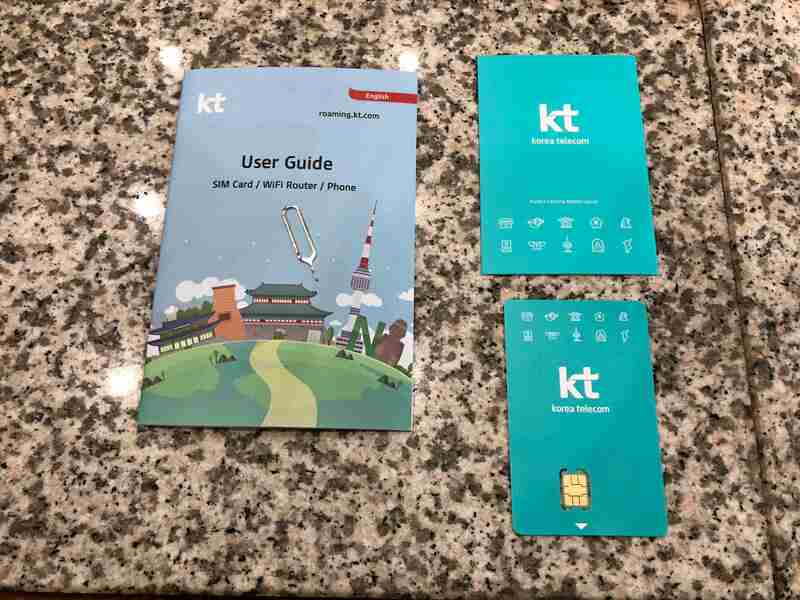 It’s a KT Olleh SIM Card with unlimited 4g/LTE data connection. For 5 days of use, I paid ₱1,197.0 ($22.83 ). It has 120 hours of validity with free incoming voice calls and incoming text messages. I claimed it at the KT Roaming Center, 1st floor, Gate 4-5 of Incheon Airport. In Manila, the train system is so horrific, I avoid it like a plague. But when I travel abroad, especially to the more developed countries, the train is my most preferred mode of transportation. It’s the cheapest, fastest, and easiest way to get around the city. 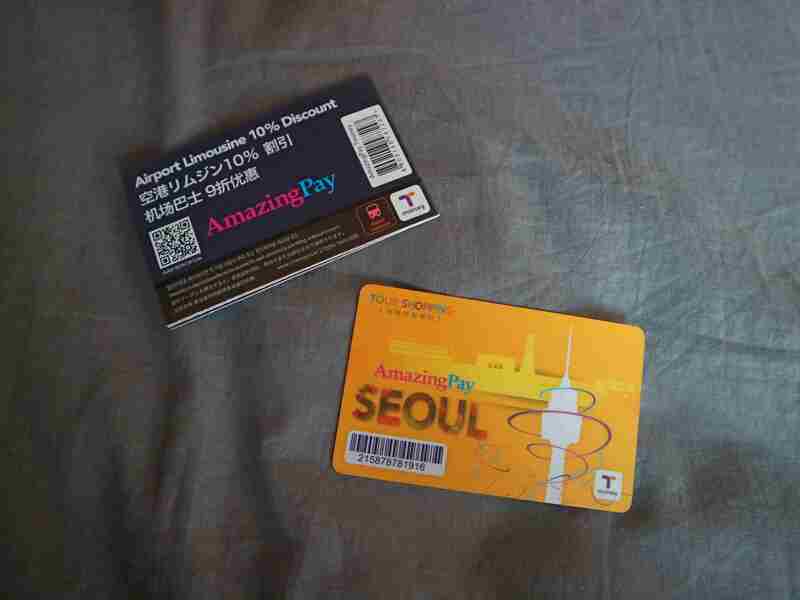 I purchased an Amazing Pay T-Money before I left the airport and used it on trains and buses around Seoul. The airport has a bus terminal that could take passengers to the different parts of the city. I could get there a lot faster by train, but I wasn’t in a hurry and took the bus instead. 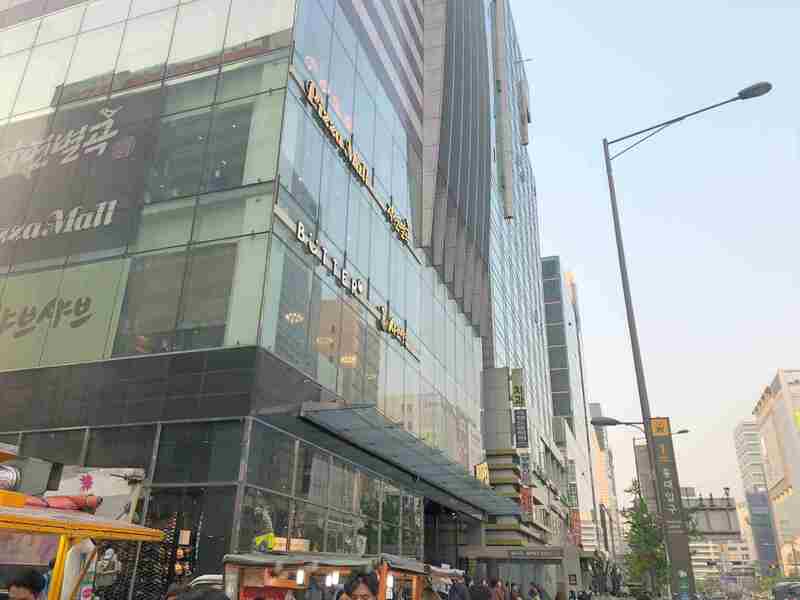 While searching for a lodging in Seoul, it was a choice between Myeongdong, the shopping district of Seoul and the more hipster, Hongdae in Mapo-gu. The lure of the urban arts and indie music culture of Hongdae is what ultimately compelled me to choose it over Myeongdong. From Incheon, a bus ride to this region takes about an hour. I took off when the bus stopped at Hongik Univ station. 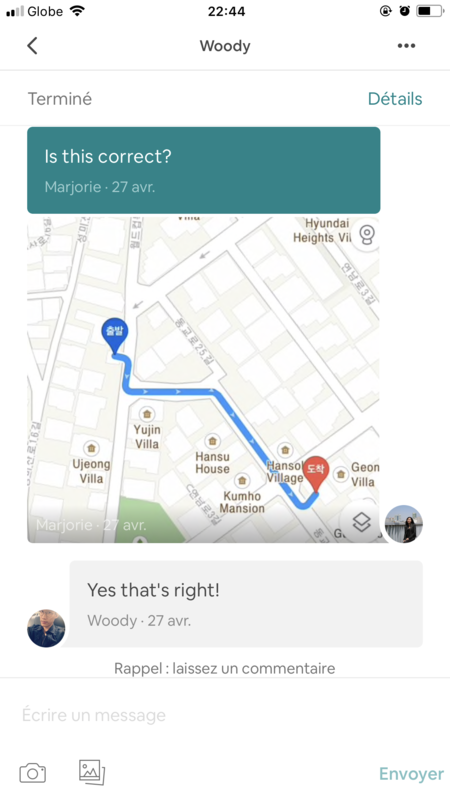 My Airbnb host sent me a detailed instruction with screenshots on how to get to his guesthouse. I was supposed to take the Hongik Univ station exit 2. I approached two girls in the waiting shed and asked where exit 2 is. They looked and whispered to one another, stared at me, and said that they don’t know. I later realized that they don’t speak English so they denied that they knew the place even when, in fact, they did. Why did I come to the conclusion that they lied to me? Well, Exit 2 happens to be just across the street. They looked like they are students in the area, it’s unlikely they don’t have any idea where Exit 2 is. Hongdae to Seoul is what the university belt is to Manila. The population is markedly young, mostly students studying around that area. Majority of them are wearing stylish and trendy clothing that it’s the few drably dressed who stood out. In this respect, they reminded me a lot of the Japanese who also like to dress impeccably. With my backpack and small luggage in tow, I spent almost an hour searching for the guesthouse. I know that I mentioned the host sent me an instruction with pictures, despite these, I still managed to get myself lost. 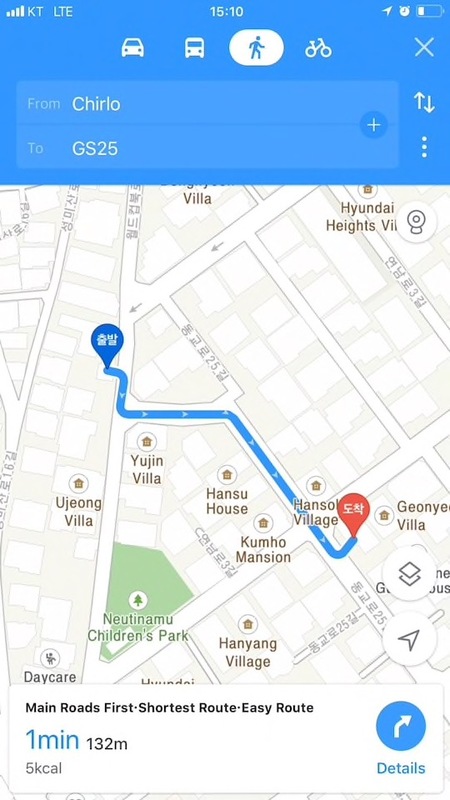 Adding to my frustration is the fact that Google Map is almost useless in South Korea as it doesn’t work in walking directions. I approached people on the street to ask for directions but because most of them don’t speak English, they couldn’t really help me. There was this one guy who spoke good English but he didn’t know where the location is. I booked this Airbnb accommodation because it was inexpensive but it looks good on pictures. 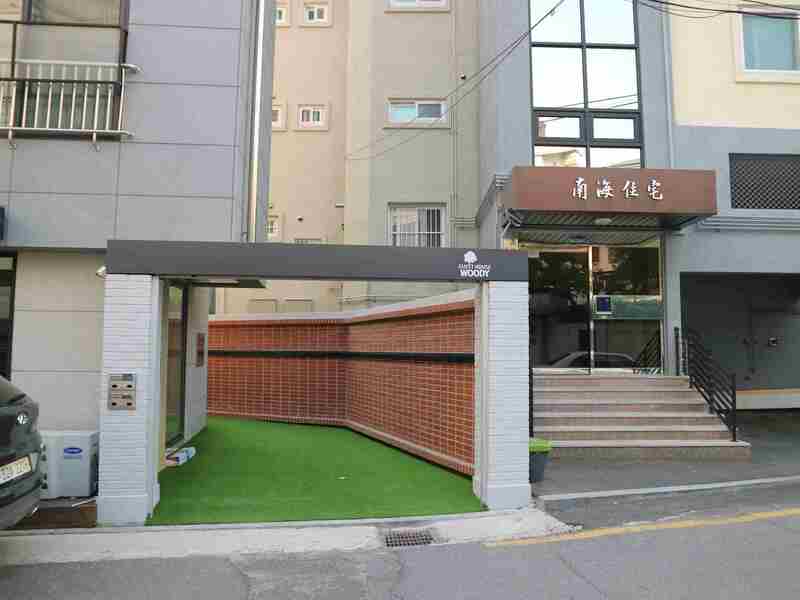 It also has good reviews from previous guests who said that the place is in a quiet neighborhood. What I didn’t expect is that it would be a long walk from the Hongik Univ station and that it would be hard to find. I wanted to cry and started regretting my decision for choosing it. I think I stayed for like 20 or 30 minutes on the side of the street figuring out what to do. I searched the Internet and found out about Kakao Map. I downloaded the app right away and since the name of the guesthouse itself is not listed on the map, I figured I should just enter the shop sitting next to it, Chirlo. I sent the screenshot to my host for confirmation, he answered in affirmative. I continued walking, this time with the help of Kakao Map. I felt a wave of relief wash over me when I finally saw the building of the Airbnb that took me forever to find, Guesthouse Woody. My friend and I agreed to meet that evening but she wouldn’t be arriving until 8 or 9 p.m. I found myself with a renewed energy after a quick rest in the guesthouse so I decided to explore the city. I walked several blocks until I reached the Hongik Univ station where I took the subway to Dongdaemun. Remember the title of this post? Well, I chose it for a reason. I was originally intending to visit Cheonggyecheon River but I got lost again! I just continued walking and realized that I was already hungry. I saw a line of food carts on the side of a street and decided to get something to eat. 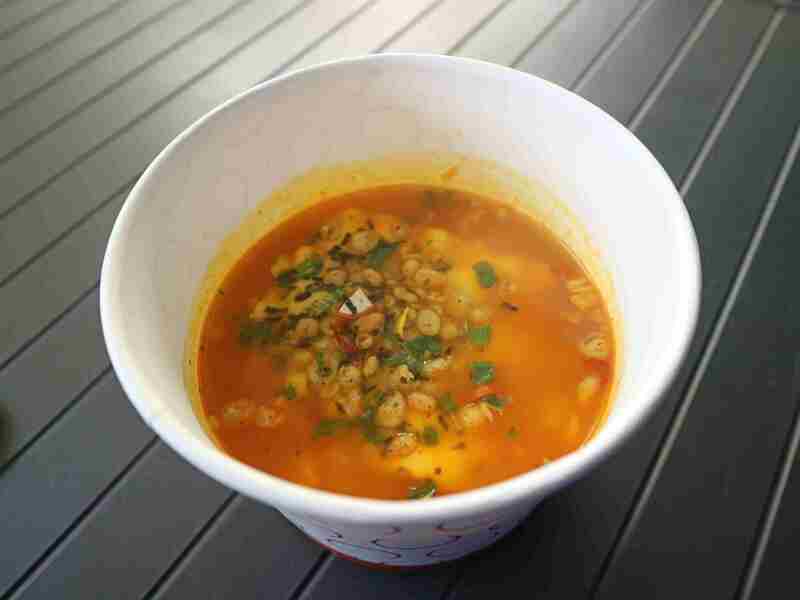 It turned out to be my first greatest find in Seoul; the most delicious spicy cheese ramen. It was already dark so I gave up on the idea of finding the river. Besides, I doubt it would look half as beautiful as when it is under daylight. Getting lost in a city is not necessarily a bad thing as proven by this incident. 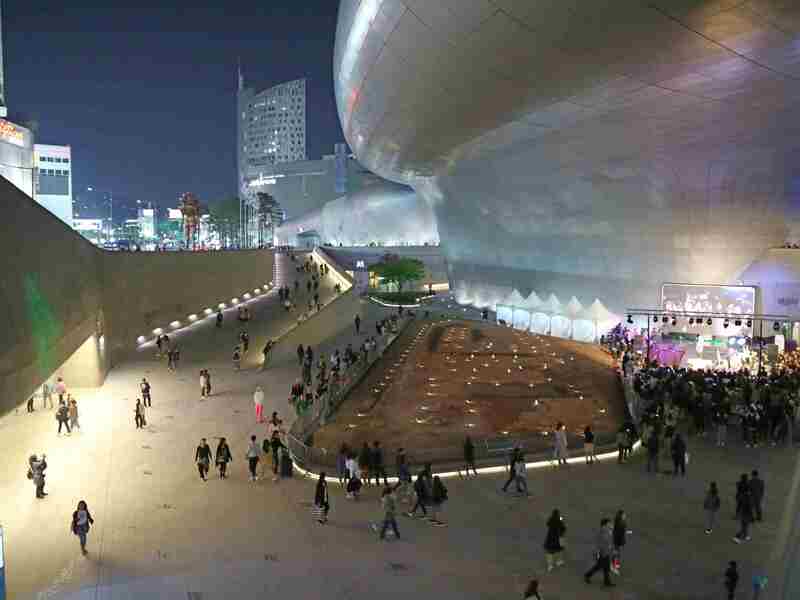 Because I got lost, I had unwittingly led myself to one of the best spots to see in Seoul, the Dongdaemun Design Plaza (DDP). 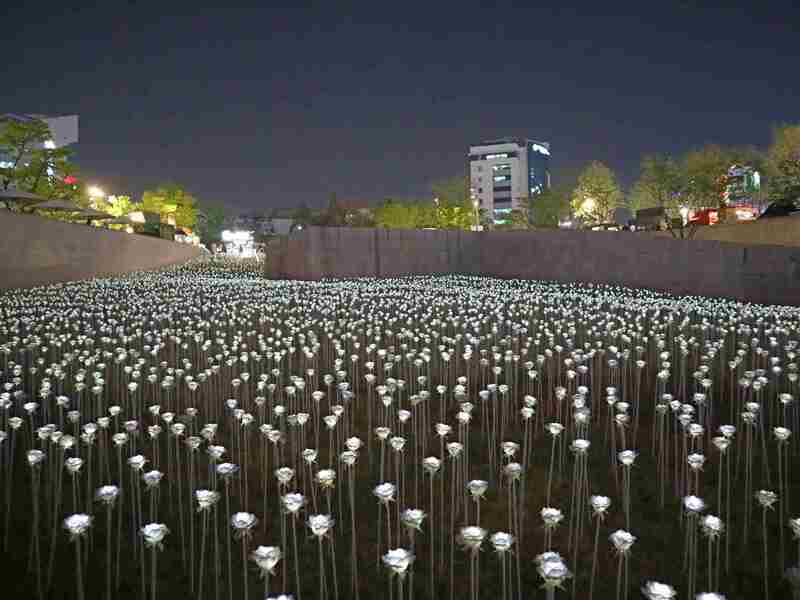 DDP is a major urban landmark in Seoul. It has art halls, museums, retail stores, media hall, and parks. 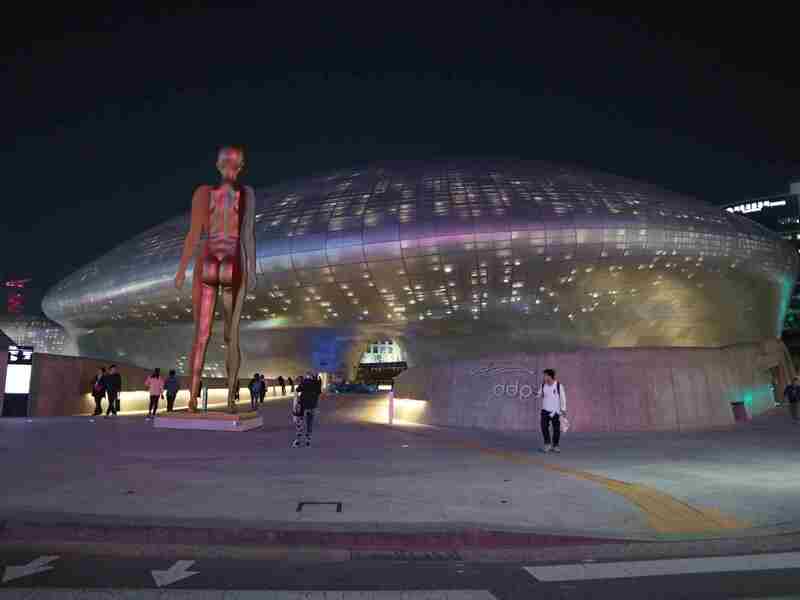 It holds different events such as art exhibition, musical concerts, fashion shows, and forums. I walked around to check it out and found live musical performances, food trucks, and this beautiful garden of LED roses. See, getting lost is not that bad. 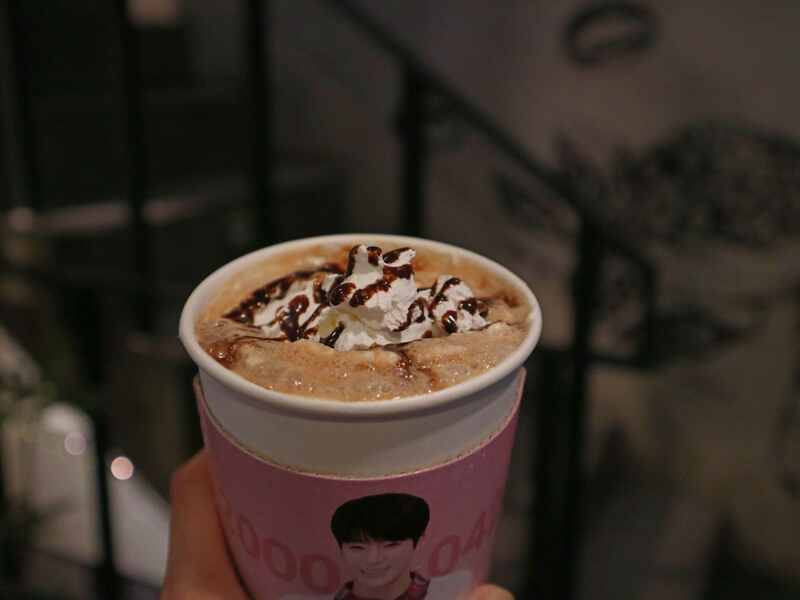 I went back to Hongdae to a cafe called, Golden Crema to wait for my friend, Krish. The cafe is busy but I managed to find empty seats by the window. I ordered a mocha latte then the barista handed me a restaurant pager, only it doesn’t look like your typical coaster pager, this one has a small TV screen showing ads, so cute! Krish arrived with a Korean-Filipino friend of hers who grew up in the States named, Lino. 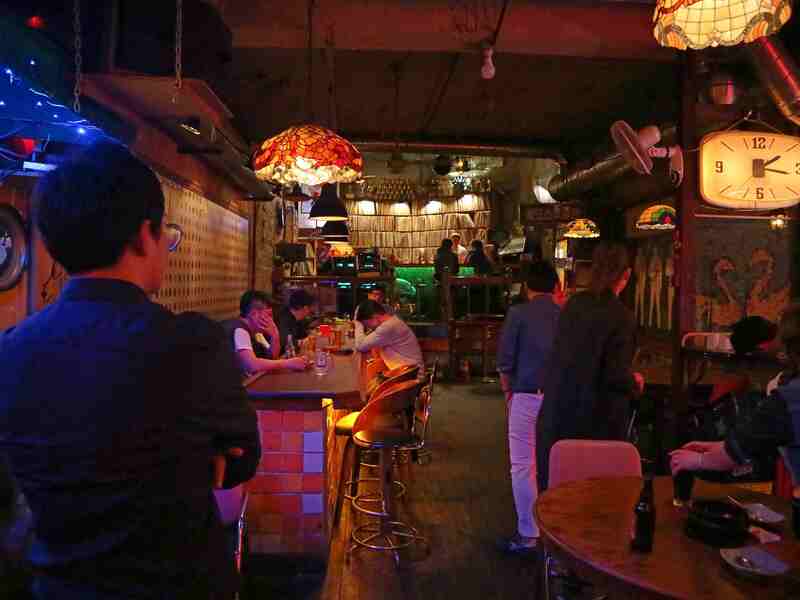 What ensued is a night of bar hopping around Mapo-gu. 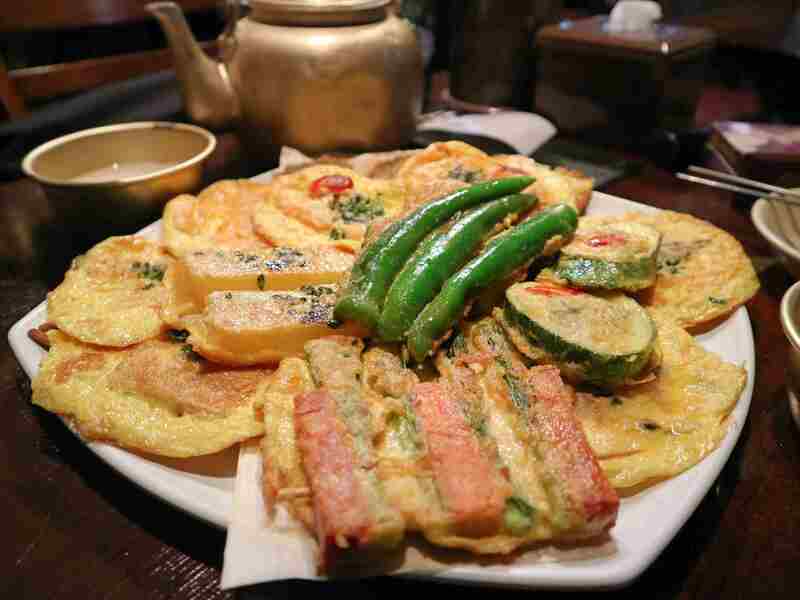 We started in a crowded resto bar where we tried what they call Buchimgae or Korean pancake. It’s basically pancakes ingredients, e.g., spam, okra, crab, fish soaked in egg or batter then fried on a pan. They were delicious. In the middle of our late dinner, a soft-spoken, skinny Korean guy who is a friend of Lino joined us. 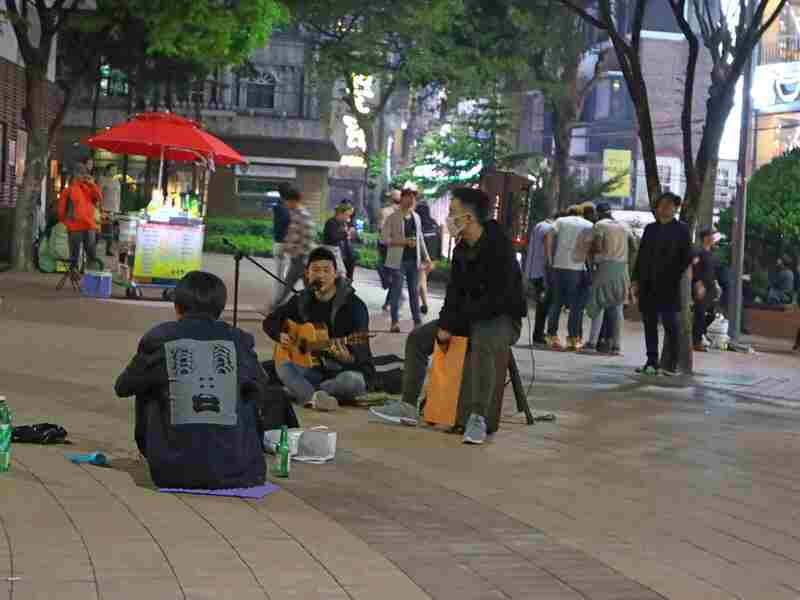 After our late dinner, we ambled toward the streets and found this open space teeming with young people drinking, hanging out, and watching street performers. I kinda wish there is a place in the Philippines like this where people are free to go and showcase their talent or enjoy indie music on the street. We went to two more bars; one played EDM filled with people in their teens, the other played Korean traditional music that catered to a more mature audience, probably in their 40s. It fascinated me to see the contrast between the two. While the young people in the first bar danced slowly like they were high on something, the second bar had a more festive atmosphere with patrons dancing, laughing, and singing along to every goddamn song played that night. It seems like the older people knew how to party better than their juniors. I’ve lost track of time and I’m not sure what time we called it a night. The two men walked Krish and me to our respective places of accommodation. By this time the cold had gotten worst, seeping through my clothing, chilling me to the bones. I’ve lost count of the times that Lino said that it’s cold, which he interchanged with, “your place is fudging far.” They had chosen to take another path so I didn’t know how to go back to the guesthouse anymore. Thus, even if I wanted to walk home on my own, I couldn’t send them away. Finally, we reached the guesthouse, gave them a very awkward quick hug, said my goodbye, then I went inside. And that’s how my first day in South Korea went. If you want to see more visuals, here’s a video that I made of the day.